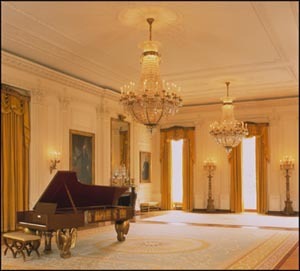 The East Room, scene of many historic White House events, was designated by architect James Hoban as the "Public Audience Room." It normally contains little furniture and traditionally is used for large gatherings, such as dances, after-dinner entertainments, concerts, weddings, funerals, award presentations, press conferences, and bill-signing ceremonies. Today the East Room retains the late 18th-century classical style to which it was restored by architects McKim, Mead & White during the Theodore Roosevelt renovation of 1902. An oak floor of Fontainebleau parquetry was installed at the time as were the bronze electric-light standards, upholstered benches, and three Bohemian cut-glass chandeliers. The walls were paneled in wood with classical fluted pilasters and relief insets. The paneling was painted white, and delicate plaster decoration was added to the ceiling. The full-length portrait of George Washington that hangs here is one of several replicas painted by Gilbert Stuart of his "Landsdowne" portrait. It is the only object known to have remained in the White House since 1800--except for periods of reconstruction, such as after the British burned the mansion during the War of 1812. Local artistry, 1818: President Monroe purchased 24 chairs for the East Room from William King, a cabinetmaker in Georgetown. One of these chairs is pictured here. During the Civil War years and the administration of Abraham Lincoln there was much activity in the East Room. At one time during the war Union troops occupied the room. When President Arthur redecorated the White House in 1882, Louis C. Tiffany found it necessary only to install silver paper on the ceiling of the East Room and to increase the number of potted plants. All of the heavy victorian adornments were swept away in the 1902 restoration. During the Theodore Roosevelt Administration, this room became the scene of some unusual activities, including a wrestling match arranged to entertain some 50 to 60 guests of the President. The exuberant Roosevelt children are also known to have used the East Room for roller-skating.